Pulkit Agrawal is the Co-founder and CEO of Chameleon, a SaaS Platform for Targeted In-Product Guidance and Marketing. 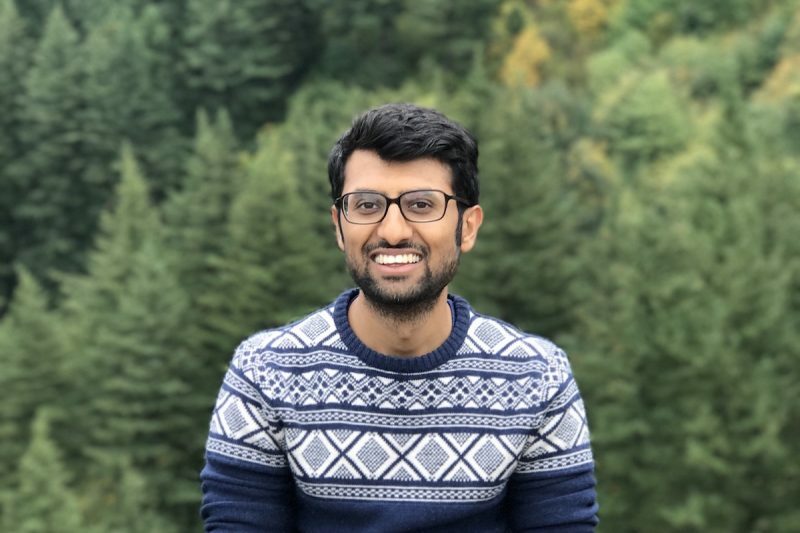 Pulkit previously worked in data modeling and analysis in London, helped unemployed youth start businesses in rural India, and read Engineering at University of Cambridge. He follows Liverpool FC regularly and enjoys meditating and (experimental) cooking. Hey, Pulkit thanks so much for joining me today. I really appreciate you jumping on the SaaS breakthrough podcast today. How are you doing? Good. I'm really excited to be on here and thanks for having me. Yeah, I'm excited too. You know, it's not often that we get a co-founder, CEO on this call. Typically we're talking with the marketers, but you guys were in the position where you were actually running a lot of the marketing and the company over the past few years. And before we get into some of the topics that you were doing and some of the awesome initiatives that you've done to grow the company so well, you know, why don't you take a step back and just give us kind of a quick overview of Chameleon your company, you know, when you found it, who the customers are and what you guys are trying to do uniquely in the marketplace. Yeah, absolutely. It's funny because my wife always says that if she had a dream team, startup dream team, she'd hired me as the head of marketing. And that kind of always, it's kind of a compliment, but it asks me cause I'm like, what about my product? And my other expertises but yeah, I definitely enjoy marketing so I'm going to enjoy talking about this. In terms of Chameleon, we're a platform for product led growth. What we've seen over time is that software's become really ubiquitous. There's so many different applications and users have to learn how to use all these. And for companies it's really important that users understand how to get started with new software but also start adopting new functionality. And the way that it's typically done that right now is either through trainings, webinars, help logs, blog posts, and it's not as interactive as would be ideal for a user. So Chamelean lets companies build interactive in product guidance and marketing without writing any code. And so what that means is that you can create things like banners, tool tips, walkthroughs, flows, widgets, all of this stuff without writing any code to help your users learn your software and help them achieve their goals. And that leads to improve activation rates, more feature adoption, better engagement, etcetera. Some of our customers include the likes of Gusto, Flexport, Moz, Choppy, but we work with hundreds of companies, small and large to do this. It's a new space. So we love help companies also learn how to best leverage this kind of new channel for driving user engagement and user and user success. When did you actually found the company? We found, I think our official founding date is 2015. We kind of came across this idea because I was trying to learn how to use a Asana and I find myself using two monitors, switching back and forth between a help video where I play it, pause it, then go into Asana and then take those actions, then go back to the video, play, pause, go back to Asana and kind of felt like, why isn't it this more easy and why can't I have something that's in product and helping and coach me. And so that's where it came from. And and we've been working on it since then. There's been a lot of progress and improvements, spaces developed and happy to chat all about that. Oh, that's fantastic. I love products that come from, you know, your personal pain. We actually had that same thing. So you guys got into this project. You said, I, you know, I have this pain point. I want to try to solve that. You guys started building into this kind of new marketplace. There are some other tools that you guys are doing it in a really unique way and I think that's amazing. So when you were just kind of launched, you're coming into that like, hey, we need to launch this product, we're needing to get into marketing. How are you initially going out there to find product market fit? Like what are your, what are you thinking as far as who you have to go after? Who the target market is going to be? Yeah, so right around the idea stage and problem validation stage, we spoke with a lot of founders and product people about, you know, how do they currently solve this problem today? And whether they view this as a problem. And it was very evident and quickly evident that it was a pain point. And we heard things like, oh yeah, we need to fix user onboarding but we haven't got round to it. We know it's a real pain and we know we're losing a lot of people but we don't know what to do. And so we knew that there was a space around user onboarding or a kind of a flow on run user onboarding that was painful and resonated quickly. And so that was the first piece knowing kind of really what is the user or customer's pain point. And we heard the same story again and again. And so a lot of our initial messaging, positioning content was around user onboarding. And even today that's really important. We've now branched out into more use cases as teams think about ongoing product experimentation or ongoing feature adoption. But user onboarding, you know, gravitating around that really helps. So that helped us center that the marketing and you know, initially it was around content. It was around using the network to get intros. And we began with kind of doing informational interviews. So when you're very early in Europe, couple of people and you're trying to figure it out, it's, you know, people are open, especially in the bay area, but also in other startup hubs. And just giving you feedback. So we went in and said, hey, we're working on this problem. We know other people have this problem. Do you have it also, we'd love to get some feedback and buy your coffee and that initially is the beginning of kind of a, you know, an outbound sale. If, if the problem is a problem that customer or that person faces, then suddenly they're much more interested in your solution. That's a really interesting point. So let's say you're going out, you're, you're showing them kind of your product or your early product at that coffee. Are they actually turning around and buying a license in the software or is it just kind of opening the door to a conversation for you then to sell when the product is ready? I just, I just wonder about how that transition takes place. Like are they ready to invest right there or is it more just about the relationship building getting in front of that target prospect? Yeah, it depends on who the prospect is a little bit. You obviously can't walk into an enterprise company and just (inaudible) them a license. We targeted established logos, but that were still early. I remember very, very early before we were even, well, you know, before incorporation, we were actually just, this was just an experiment and a project. We pinged a bunch of YC companies and be like, Hey, we have this thing that we want to help companies with, is anyone interested? And we got some responses. And we ended up just doing a very simple custom build for a team and they, and you know, the thing that they gave us was access to a production environment where they could, they would deploy our code and have their users interact with it, which is amazing validation. And, and what we gave was like, you know, we'll help you solve your onboarding issue. So that was very early on and (inaudible) kind of got was from, you know, out cold emails and then just having a conversation telling them what we're doing. And it was very informal. In other cases it was a little different. In other cases it led to a conversation where then there was a demo and then there was other people that needed to be involved. And it's a different sales process. So it depends a little bit on the type of customer but don't, for new teams, don't get hung up on that. Like if you can get to the speed of product validation quickly with a smaller team, then that's probably as valuable as kind of nailing a sale really early on. Has that outbound been, was that a lot of the initial marketing strategy to get out there to kind of get the momentum started? Yeah, it's kind of changed a little bit over time. Pre, kind of pre launch, we did a little bit of this outbound meetings. Then we decided that we wanted to launch and get feedback quickly from a lot of people testing this. So then we ended up presenting at a conference, and launching there and that just spiked our interest. We, I think we also, I think at that point we'd raise some money and we announced our funding at the same time. So that have got a bunch of, you know, interest and that allowed a lot of people to start using the product. And then that got us the kind of feedback we were then looking for, which is, you know, edge cases, polish around the key flows, what people try to do, etcetera. So that was the next kind of phase of it. And I think, you know, we're now circling back a little bit more on the sales front. We're developing a sales team and building sales processes to go up more and more upmarket. So I guess our kind of distribution strategy has varied based on kind of where we've, how far along we have been. For sure. And what about the event? What event was it and how did you guys decide on that specific strategy from all the different channels or opportunities that were out there early on? Yeah, so the event was the launch conference. I think run by Jason Calacanis and it was, I think we had the opportunity to do it. I think it was either somebody who we knew who was an investee and told us about it. I can't remember exactly how we found out about it, but the reason we did it was because it just matched our timeline. And one of the important components of that was this was going to be a forcing function for us to build momentum and get into the market and go into general availability. So we set it as much as an internal goal of okay well we're gonna anchor our launch around this conference, which is not movable and therefore we need to get all of this stuff done by then. And actually that's been a pretty effective strategy since then to help keep momentum and focus is to anchor product launches or anchoring kind of development to other events. So we say we're going to launch on Product Hunt at this time or we're going to launch something else at this time and then you know, we have to get it done. And if it's, if we're struggling then it's about well how can we scope this down or simplify it to be able to still get it done. I like that advice. I mean we used to do that. We kind of stopped that approach because it added so much internal stress to all the teams to like hit the specific date. Do you guys see that stress ever get like out of control with that type of like event based releasing? There is, there is stress. It feels like there's a race and there's a lot to get done and we're kind of scrambling. And so I think, you know, we have to, you have to have, find the balance of you can't have every feature release be around the event cause it adds unnecessary tension. But I think at least on the level of, okay, this is our quarter planning and you know, in this quarter we want to have this as the main release and this launch and next quarter we want to release at this time. That might be a reasonable approach for us. We're, you know, we're in this phase of foster releases so we're trying to launch something every month, month and a half. But otherwise I think that, you know, that don't think that's necessarily sustainable or scalable. Yeah, definitely. I mean, I find it amazing. I was, I'm reading Drifts book and I've had Dan Murphy on this podcast before and they've talked about how they do monthly product launches at Drift. And it's just that, I mean it sounds like you're doing something similar where you're kind of having these releases out on this monthly schedule, which is a fantastic way for growth. It's just very hard sometimes to, to constantly hit those things without having that stress. But that's fantastic. So you guys did this amazing event, you got on stage. Were you nervous when you guys went up there? We had a live demo, which I don't know if it's a good idea. But we had a live demo, and most most of the companies did a prerecorded thing or a video or something or screenshots and we were doing it and then something didn't work and I was like sweating and I mean, in the end it worked well and it was pretty cool. We demoed on Youtube showing kind of product tutorials on how to kind of edit a video on Youtube. And so it was really cool in the end, but it was definitely a sweat to, to do it, but it was fun. It was fun. I haven't done anything like that since. It was fun. You guys get offstage. You guys have this momentum going. You guys get back from the event. What's the next step? What are your next marketing initiative that you take on? Obviously an event is a onetime thing, you get the momentum now you've got to get back to the (inaudible) you have some outbound going. What are some of the new marketing initiatives you do? I know you guys have done a ton of content marketing as well. You know, you guys have courses, you have galleries, recipes, use cases. Is that the main thing you go into next? I mean aside from dealing with all of the inbound interest after that, after those events. But yeah, I think it was key to do content. I think we were very, we cared about having organic distribution before we spent any money on ads or anything like that. So I was always against using ads too early. We did use ads for testing things, but we, we didn't want that to, to supersede any of the underlying distribution engine. So content was probably the beginning. And it's something that's I think easy for early teams because the founders or the early employees are very passionate. They have expertise and you know, especially in new spaces, there's a lot to teach and educate. So I just started writing on Medium that has a, you know, an inbound distribution in fact. And then we started adding more content to our website as well. Happy to talk more about those different initiatives or the different types of content that we did and kind of pros and cons. But yeah, it is pretty much been content focused. Well, what was some of the key lessons you've learned? What were some of the wins that you had or a couple of losses as well? Always great to hear. Yeah, so I think some key wins included Quora. We find Quora has been very helpful for us. And the way that, you know, some tips on Quora was best basically that we looked at the fact that a lot people with searching for options of software on Quora. And looking for comparisons and vendors. And so we found the top answer that, I think it was like, you know, what are the competitors to some x product and had the most followers and responses. And we wrote a really compelling answer, which wasn't just why we're better, but help people make a buying decision. So we help them, educate them around the things that they should consider as they're looking for the right software and where, you know, certain software is better or worse, or how you should think about your strategy around building a product stack. How did you do the push to get them to help to vote? So that's something that we done too. Yeah, nothing, nothing crazy actually. Just like, you know, emailing friends and network, hey, I wrote this answer, check it out if you think it makes sense, please, you know, add an upvote. And it didn't need a ton of upwards for the algorithm to bring it up towards the top. And so once it was, once it was kind of at the top and probably because it was like good rich content in there as well that was a great anchor. And then what we did was we looked at other questions that were similar and suggested that Quora merge them into this question. So there was maybe five or 10 questions that were kind of similar looking at competitors. Though not as popular as this one. So merging them all into this one, which Quora obviously wants to do as you're, trying to clean it up, adds even more, you know, boost to this and this becomes the key question for this topic. And then we were at the top as a key answer. So I think that worked out and we've done that for all the cases where we, whenever we write some content we look for other any related Quora questions, can we answer them in an effective way? So we do almost like a mini blog post on Quora, include some of the imagery and then we obviously link out to a blog post. But that's, we're trying to provide advice and help on Quora. And I think that's the way most forums receive you well, if you're actually trying to help the community rather than just trying to pitch a product. Are you also kind of openly saying, Hey, I'm also one of the co-founders of this product. I may be biases but I also want to add, you know, real value in this. Yeah. Well, so I think, you know, instead of thinking, taking a negative view that like, I have a bias to sell you my product. It's a positive view that I have a bias of understanding the space and having the expertise and work with hundreds of customers on this. So I have something useful to share here. And so absolutely will, you know, not going to hide the fact that, you know, I started Chameleon. And Chameleon is also trying to solve the same problems that they're trying to solve. But I don't take, you know, defensive view of it. I love that. I think Quora is such an underrated area and I know a lot of people have struggled to get good results from it. I used to go through and put like every day we'd spend one to two hours just doing the exact same thing, writing real content in there, around posts that people had specifically around webinars and stuff like that. And I struggled to get good results with them. That's really good advice as far as merging them and then really just tracking the content to your blog posts. A lot of times I was just, you know, call the actioning to free trial or something like that. So I think it's much better as relationship mechanism to drive traffic to more content and stuff like that. So that's really, really good ideas. Any other major wins or you know, things that you think really stood out in the content marketing side? Yeah, so, we did a Product Hunt launch recently. And there was a big boost in traffic from that. And you know, we did a lot of the basic things that anyone doing a Product Hunt launch would do. One thing that I thought was really interesting, it was a new tack, very new tactic that I've tried, and I've seen this recently but wasn't sure if it would, would be effective, was have, starting a Linkedin comment thread. So I don't know if you've seen this, but have you seen it, have you come across this, where someone posts something? So basically you post something and ask people to leave a comment in the comments if they're interested in that thing. And I've seen it on my feed a little bit. And I basically, the day before, the two days before the Product Hunt launch, I made a post on Linkedin and say, hey, we have something brand new and exciting to announce, happy to give you a quick preview if you're interested, leave a comment. And we just tried it out. And one other thing that we did is, as people left comments, we reply to that comment and said, thank you and tag that person, we will be sending this to you via DM now. And we've got a ton of ton of interest because every time someone leaves, leaves a comment, you know, it raises it in their connections feed. And so we've got a lot of secondary and tertiary folks leaving, you know, their name as a comment or raising their hand as a comment. And we had like 50 or 60 comments and we had, I think it was like 15,000 views of that, of that one post, which was incredible for, you know, and obviously it was a little bit of work in replying and managing that process and adding someone on Linkedin and sending them the DM. That was a little painful. But then we were sending them the DM to the Product Hunt post saying, hey, we just launched on Product Hunt, check it out, we'd love your feedback, please upvote if you can. And so that, I think that definitely helped. And it was an interesting tactic. I wouldn't want to do it all the time because just like with every marketing tactic, it's fun until everyone does it. But you know, might be, might be worth trying for some of your business. No, I loved it. I see that actually that tactic on Facebook often. I had not heard about it on Linkedin. I think that's such an underutilized area to do that. How awesome of a strategy because it's like a very, you know, kind of niche area, especially in B2B. That's fantastic. Do you guys do Product Hunt for every release that you do? Is that part of your product launch process? So we haven't done that thus far, but we all planning on leveraging that more and more so. We've seen the massive boost that we did get from Product Hunt. It does require a little bit of coordination, but I think we're planning on doing that and especially as in terms of our product strategy, we're productizing things more and more so we have more well packaged products to release. I think it becomes easier. I am not a big fan of when people launch on Product Hunt and it's a feature update like, ah, it's not big enough. Also generally on Product Hunt things that are free or more have a broad use case do better than kind of paid products. So there's a little bit of balance to be found, but we all going to be leveraging Product Hunt more so. So that becomes more of just like, expansion of use of a new piece of a product or something like that that's coming out. I mean for free that someone's like a lead gen. Did you guys get any direct results from it? We recently did a Product Hunt for a new automated product that we did. Now this was an add on to our product and it was, it wasn't like they're getting something for free. Like you said, it wasn't specifically for lead magnets and we didn't, we, we got a spike of traffic but we didn't get a spike of sales or anything directly from Product Hunt. I don't know what was your guys' results walking away from it? Yeah, we, I mean, we've got a spike of traffic for sure, but we did get a spike of signups and for the product. Now that the signup isn't, you know, you don't purchase on sign up, there is a trial and you can download the chrome extension and play around with it, etcetera. But, we did see a boost, I think it was something like a 1.5 x or 2 x boost in terms of signups. But the really interesting thing is that it stayed high after it, so it stayed pretty high, materially higher than before and it's been, you know, some weeks. So it's really fascinating that there's been a knock on effect. And so we've been, we've been really psyched about that. No, that's amazing. Especially if you guys continue to utilize, you know, Product Hunt for different releases and stuff like that. You guys will have this really nice evergreen traffic coming in from there. So two really underutilized areas for content marketing. I love that. And again on your website, you guys have a ton of content you've invested in as well, but Quora and Product Hunt as well. And those are some, some really amazing successes. But what about hard lessons, or things that you wish you could maybe redo from a content, any missed opportunities there? Oh yeah, so many. I mean, where do I begin? But I think some things, you know, I prob this is, you know, probably do sales sooner. And have sales folks in earlier. I think we've been very product centric and somewhat marketing centric. Just be like, oh, everything can be self service. But I would, you know, I'd bring in sales team sooner. I think we haven't explored partnerships early enough. I think there is definitely an interesting, movement towards building best in class stacks where you are stitching together solutions from other, you know, other verticals but you know, using software like Segment or other piping to move data between different solutions so that you can really have a best in class stack. And so we've started exploring a little bit more recently, partnerships with analytics providers that do product analytics, where there is a natural fit between evaluating what's happening in your product, getting insights and then wanting to take action, which is what Chameleon would provide. And so, we've been exploring that and I think that's interesting and I think that's going to increase. We haven't done a much a great job at conferences. So I, I've been to a couple of SaaS conferences, but we've never had a booth, we've never exhibited. And that's something that we just haven't tested enough, so I'd love to see if we can kind of test that. And I think one probably hard lesson, it was that, you know, sometimes taking too long on stuff. So we, we made this Product Hunt launch for this inspiration gallery that we spent months and months working on. But the funny thing is the first batch of effort we spent was sometime early last year. So we did, you know, a bunch of effort. We've got this to a place where we kind of soft launched it, but then we didn't complete it and we didn't like package it up and really get it out. And if we did, I think we could have had an even bigger boost because, since then we've seen a couple of other similar things appear and launch on Product Hunt. So that was really sad that we, you know, we were early and were probably the first people to do it, but then we didn't get the boost of kind of being the first timers. So I think not waiting is definitely a lesson learned and we're trying to implement that now. Why do you think you guys waited? Was it, that you just want it to hold onto everything was perfect? I think so. I think that's part of, you know, a little bit of the psychology that I need to update is that, you know, striving for perfection before, you know, showing stuff. And I think we've done a good job on the product front, like shipping quickly and not waiting for perfection, but definitely on the marketing front I still, you know, I'm very rigorous around having folks update blog content and I'm really happy with it, you know, keep cycles on the website until I'm really happy with that. So I think I have a bias towards really excellent marketing. And so that's probably what held us up. Definitely. And I think that's such a tough thing to break cause you want excellence, but it's all about getting stuff out. And I always say it's better to go lean in and then update. So that's been something that I've really tried to push into the team and to our marketing and stuff like that as well. But you mentioned a couple of other things, which was, you know, conferences we've struggled there. That's a hard one to do. First of all, I'm surprised we haven't met at SaaStr before. We'll have to meet up next time you go. But there, there are a bunch of really good podcasts episodes here with SaaS breakthrough where a bunch of SaaS marketers talk about how they've made conferences work. Partnerships being a huge part, like you said, a huge part of marketing in 2019 and finding how to build those stacks. I think the prior episode that we just have or just had had like a really good, you know, lessons and tips around partnerships. So that's been fantastic to hear and I appreciate that transparency. I mean, I feel like as founders we always see so many things that we could have done differently, but it's all about just improving and getting better moving forward. So that being said, looking forward in 2019, what are some new opportunities or maybe even new challenges that you see that are coming up in your industry and your (inaudible) industry that you're excited for? Yeah, I mean, I'm happy to tell, you know, my general view of marketing and where it's changing, I think there's, content is, is really noisy. So there's kind of trying to think about how you really differentiate in content is a challenge for everyone I think. And I see that going towards providing more interactive content. So moving beyond just docs or reading text content is stuff that's either lead gen tools or other little like, interactive experiences. And then I think for us and our industry, I think one of the biggest movements, so it's really exciting is move towards more product focused marketing. And so, you know, how as we move into a product first world, you know, everything is about engagement. And whether users are succeeding in the product, and people care about the product. Sales is moving away from kind of a relationship based sales to being more product driven sales. Whether that's, and there's so many examples of that product qualified leads or what not. So I think product and using product for marketing, but also marketing to your existing customers inside of your product. That's a big, big, opportunity that I think a lot of companies are not taking on yet, which is that the best time to engage your users when they're actually actively in your products. So how do you market to them and how do you tell them about whether it's new features but also different plans, whether it's conferences or other events or webinars. So I think those are some things that our companies should be thinking about in 2019. Do you have any ideas of how to do that marketing internally in your product? Yeah, I mean, I mean actually it's kind of funny because I don't know if you, if you led with this, but that, you know, that's what Chameleon helps you do. But regardless of Chameleon, you know, thinking about what, when you have a launch that's a launch that you're sending an email or Product Hunt, how are you providing information about that launch inside of your product? And so whether that's getting your existing users to help you upvote something or help you comment on something, but also express interest in something. So thinking about how do you bring that into the product, and engage those people. Emails are just so noisy, so it's not sufficient. That's great for people that are not in your product and that's the only way you can get to them. But for those that are in your product, you know, you have to find better channels for that. I love it. No, I really do. And definitely a product that is so needed because one, you guys have also removed the engineering aspect out of it, and the hardship of that. Like that's our biggest holdup across the board when we want to do things. It's like, man, how do we find room in engineered to do that? So you guys have really kind of circumvented that and that, that's fantastic. Any other pieces of advice you want to leave with? Yeah, I mean there's always so much advice, but I think iteration is important and I think, you know, get something out in the market and then build on it and try it again and again. But yeah, good luck. I appreciate it. That's awesome advice. Really good stuff here with the content initiatives, what you guys have done to get here. So I'm excited for you, but I want to move over to the lightning round questions. These are just five quick questions that I'll ask and you can respond with the best first thought that comes to mind. You ready to get started? All right, let's do this thing. What advice would you give for early stage SaaS companies starting marketing today? I heard somewhere that first time founders focused on product and second time founders focused on distribution. So the main advice is to start the distribution journey day one or pre day one, day zero and not just focus on product. Well that resonated so true with me. Wow, that's great advice. What skill do you think is vital for marketing teams to improve and build on today? I think product marketing, we own a product fast wild. So the goal needs to be driving product interaction, product engagement, not just page views or blog posts views. So we need to think about how do we get people into the product and using the product more. I love it. So, so true. What about a best educational resource you'd recommend for learning about marketing or growth? Yeah, two. One is I like the ChartMogul's SaaS Roundup. It's a broad overview of what's happening in good articles. I think the quality is really high. And the second one is I think you should follow the Drift's VP of marketing, Dave Gerhardt on Linkedin and that will give you a good sense of the kind of some of the cutting edge Linkedin tactics, but generally marketing tactics that Drift operates with and they're great at that. Absolutely. And to add on to that, get their new pdf Drift "This Won't scale". Fantastic. He has a lot of notes in there as well. Really, really good. Okay. What about a favorite tool that you can't live without? So the one that I really can't live without is OnePassword because I use that for everything and we have that set up for our team as well as individually. So that's key. And I hope everyone takes care of security, and uses really strong passwords that is important. So that's my, my favorite tool. I actually use that too. And I think it's so important and it's actually funny that you say that. It's just such a good reminder of what a simple product can be when it's done really well. And also something that solves a real pain point that we don't even think about. And now we're like, it's a very sticky product. You know, now we're really tied into it. Will never leave me because it solves that problem so well, so that's an awesome tool. What about a brand business or team that you admire today? Okay, I'm going to give you all three. So I admire the Intercom brand. They've done a great job building that and it's often, you know, it's been with through content marketing events, etcetera. I love the ClearBit business. They're amazing as a SaaS company, how profitable they are, how they've grown the business. That's amazing. And then I love my team. So the Chameleon team, I'll give them a shout out they're awesome and super hardworking, very intelligent and just really committed to the cause, which is awesome. No, that's awesome. That's awesome. You've got all three in there and good for you to have such a great team. It's such a big part of building a great SaaS, but I just want to thank you so much for, for coming on, for sharing this knowledge, for being open and transparent. I know it's, it's hard to do both the marketing and the founder thing. But you've done a great job and you guys have really created an amazing product and I just wish you guys all the best as you continue to grow and continue to go down the journey. Yeah, thanks. Really appreciate it. The questions. I loved being on here and I'm definitely interested in checking out some of these other podcasts where I'll learn how to figure out conferences and partnerships, so thanks for that tip. Yeah, absolutely, and if you figure it out, we'll bring you back on the show and I'm going to learn those tips or we can implement them as well. Sounds great. Thanks. Awesome. No problem. Thanks again for jumping on and we'll talk to you soon.